Craft an invitation that goes beyond the basic details by creating one that fits with the theme of your day. 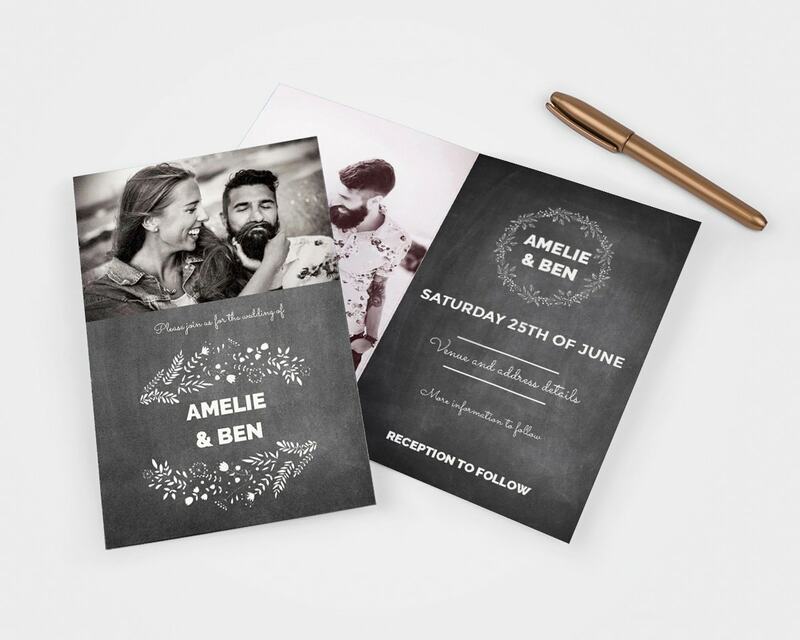 We have over 20 different pre-designed wedding invites for you to choose from, and we’ve cherry-picked some of our favourites below that fit with different wedding themes. All our designs are fully customisable so you can add or remove elements to make it right for you. 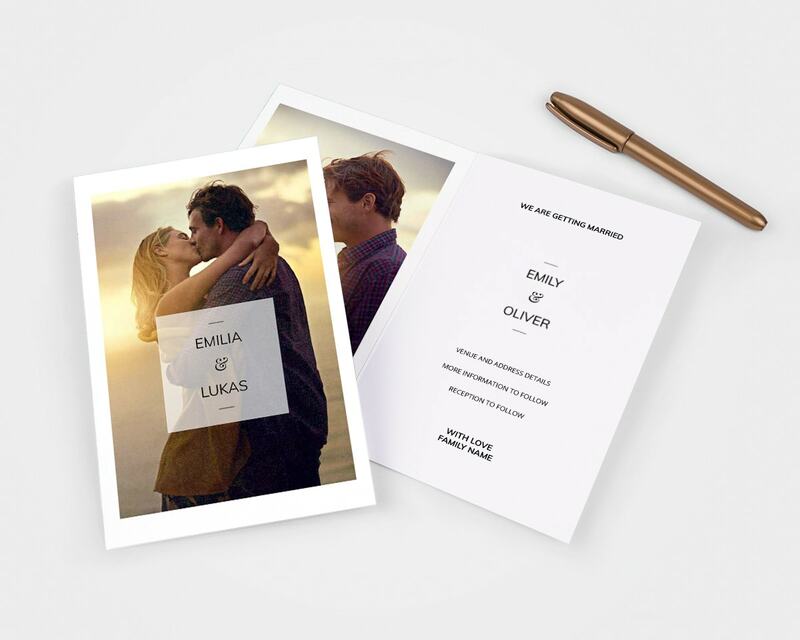 And if you can’t find one that perfectly suits your big day you can also create wedding invites from scratch. For some people, less is definitely more and with so many details and décor options surrounding weddings, it’s sometimes better to just keep things simple. Minimal doesn’t have to mean boring though. There is beauty in simplicity. 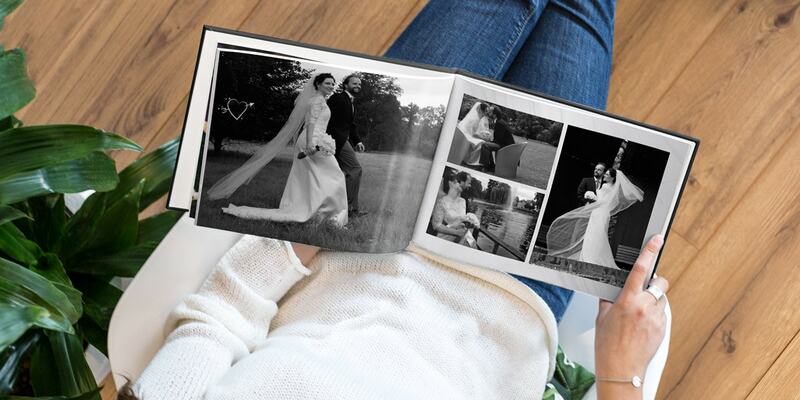 Think clean lines, neutral colours and natural light and keep the focus on the happy couple. Our square minimal card design is perfect for minimal weddings. 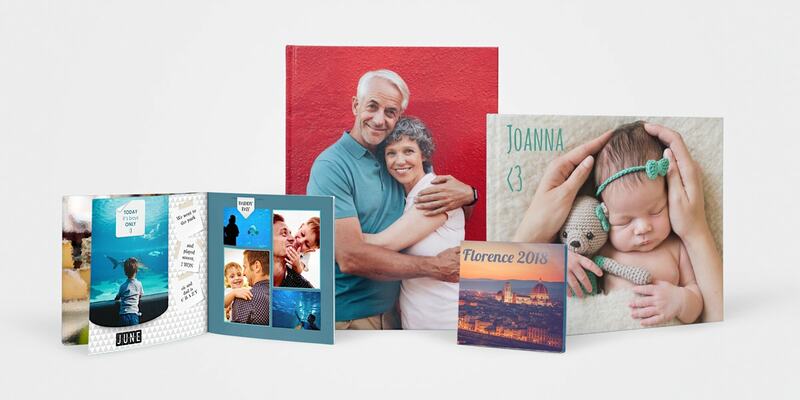 Let the photo be the focal point of your card and feature just the names on the front. The rest of the details can go inside. The white border and simple font give it a clean finish. Modern weddings can mean anything from not taking the man’s name to not serving cake. But in terms of themes, modern weddings usually feature sleek designs, striking decorations and contemporary lighting. 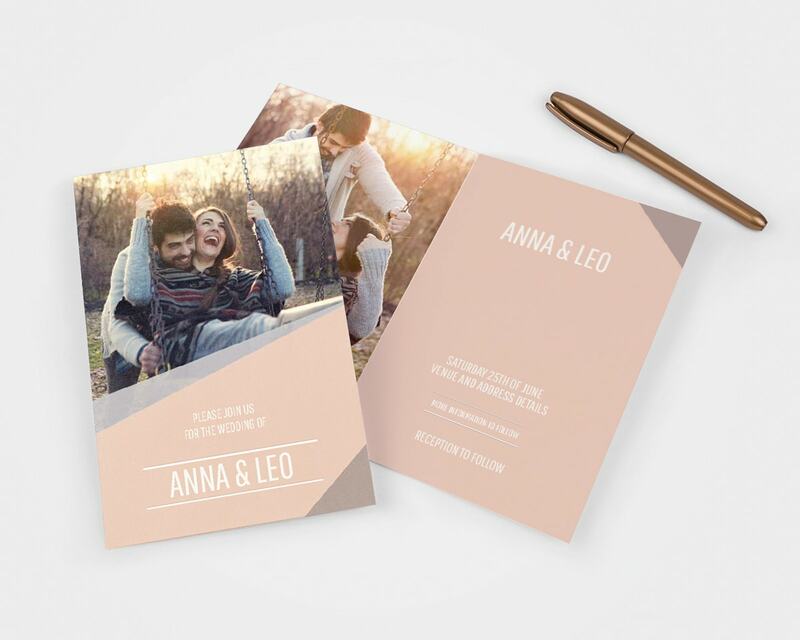 To take your modern wedding theme right down to the invites, go for our modern geometric design. The geometric lines on the front are sleek but simple and the sans serif font is very on-trend. Classic means different things to everyone but in terms of weddings, we mean traditional colours like gold, silver and cream and timeless details like flowers, lace and a triple tier cake. 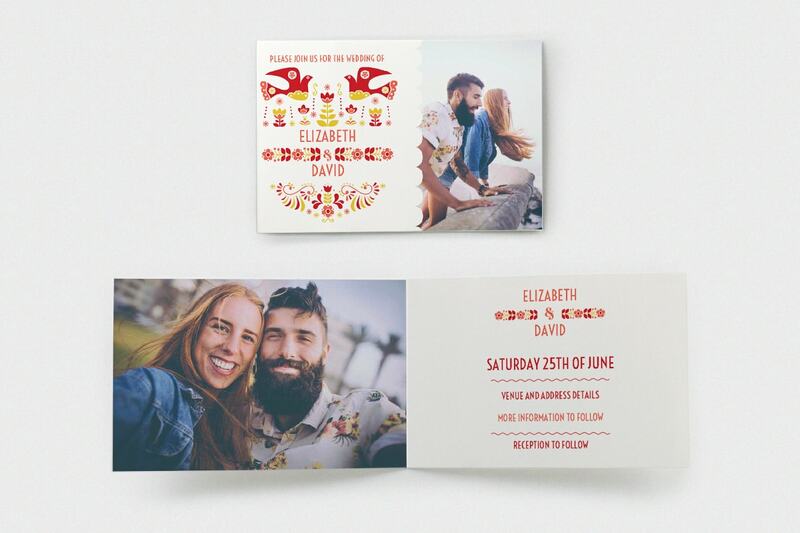 Red is traditionally associated with love so our red and gold classic design is perfect for weddings with a classic feel. The beautiful white and gold floral design is featured on the inside and on the back and the gold details give it a luxury finish. If you want to live out your very own fairytale, then a romance-themed wedding will do the trick. Floral arrangements should adorn the venue and the readings and speeches should be nothing short of love poems. 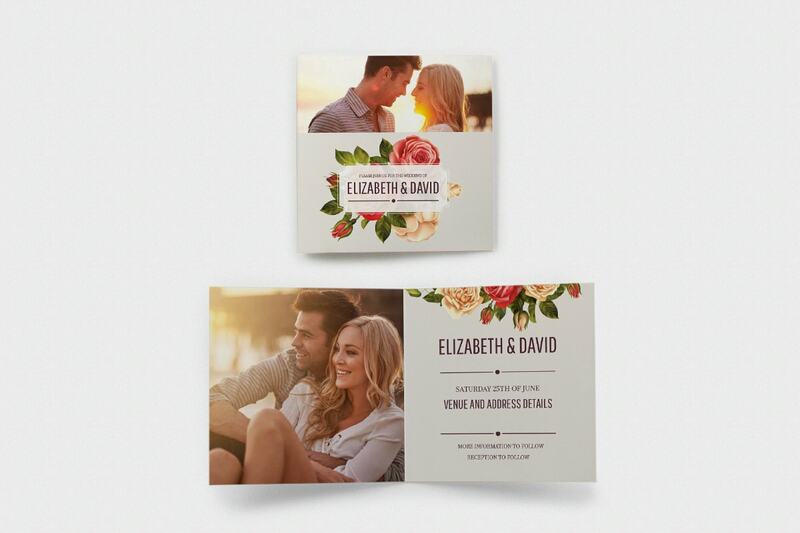 To set the tone for your big day choose our vintage flowers predesigned wedding invite. The perfect backdrop to a photo of the bride and groom in a loving embrace, it features beautiful roses as its main decoration – the flower of romance. The trend for bohemian weddings isn’t going anywhere so embrace the nature-loving, free-spirited vibe and plan a unique boho wedding. Take inspiration from hippy culture and look out for natural materials, floral hair pieces and cascading bouquets. 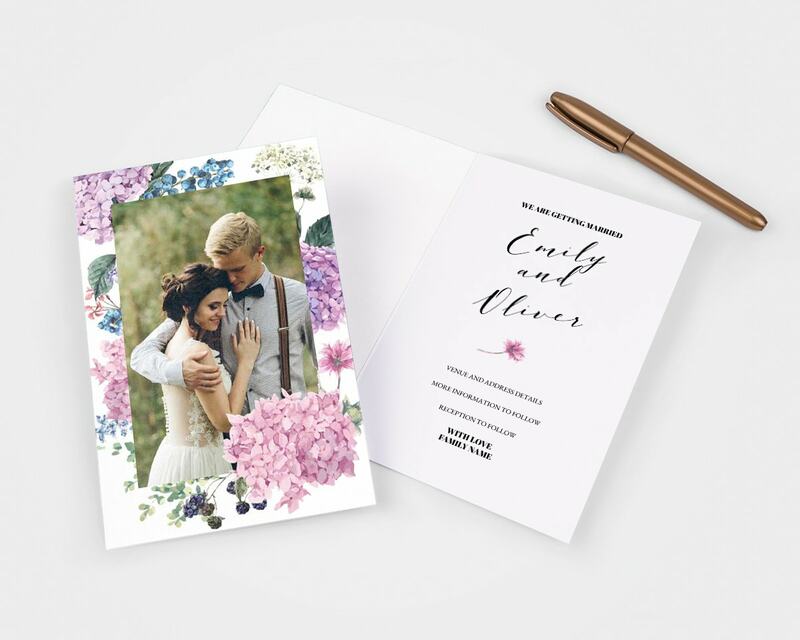 Our classic flowers script wedding invite will set the tone for your big day and let the guests know that they’re in for a bohemian-themed love-fest. The whimsical pink and blue flowers on the front are carried through to the inside where there’s a single foxglove illustration. For your vintage wedding you could choose to plan it around a particular era (say the twenties or the fourties) or you could incorporate a whole host of retro-themed fun into your big day. The beauty of a vintage wedding is that it never goes out of fashion so you can rest assured you won’t regret it in years to come. Your guests will love our vintage engraved wedding invite. The neutral colours and hand-drawn flowers have a distinctly retro feel. Simply add a photo and change the messaging inside to suit your needs. Glamorous weddings are all about being over the top so go for gold and glitter. From the venue to the interiors and the dress to the wedding invites, prepare to truly sparkle. 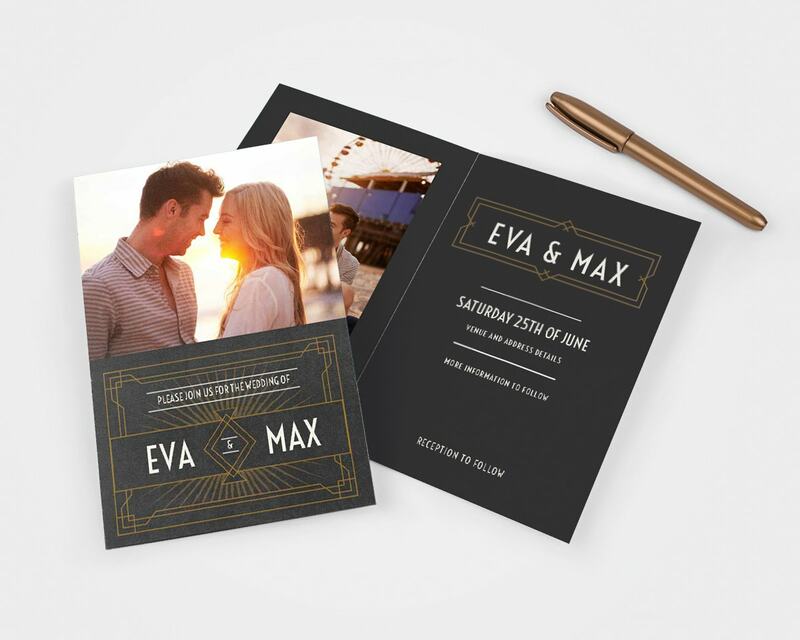 Our grey and gold classic invite has an undeniably glamorous aesthetic. The dark background and the gold art deco style details scream opulence. Choose your most glamorous photo to add to the cover. Weddings in barns and on farms have become more and more popular in recent years so rustic-themed weddings have become more common too. Try and incorporate some DIY elements into your special day and keep everything low key. White text printed on a chalkboard effect background makes our rustic chalkboard card the perfect card for a rustic themed wedding. Choose a black and white photo to keep the colour palette consistent. Weddings don’t need to be serious and some brides and grooms love the idea of a playful wedding day. Think big board games to play on the lawn, favourite childhood snacks and funny photographs. 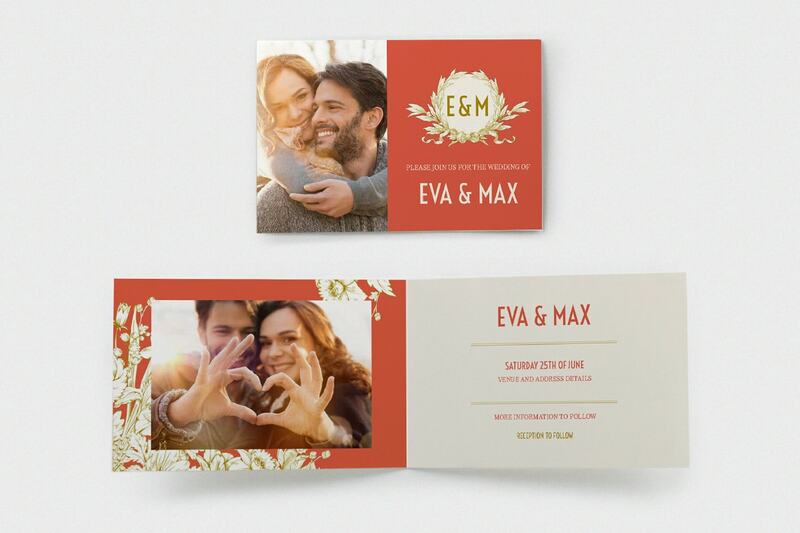 As the name suggests, our playful modern wedding invite was made for playful couples. It features bright colours and eye-catching illustrations that will look great with a fun photo. Whether you’re getting married on a beach somewhere with a tropical climate or just like the tropical aesthetic, tropical weddings should feature plants, natural light and maybe some coconuts if you can get your hands on them. 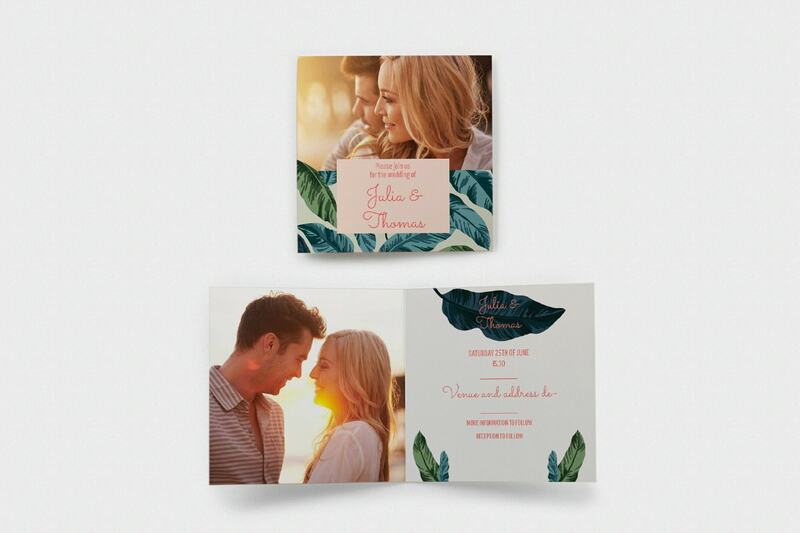 Our clean tropical wedding invitations will conjure up scenes of lush palm trees and late sunsets. The green and pink colour palette is very popular among the design community at the moment. Will you be tying the knot at a quaint seaside location? Go for a full nautical theme with navy blue and white stripes, lighthouses, seashells, fishing boats and hopefully some sunshine. 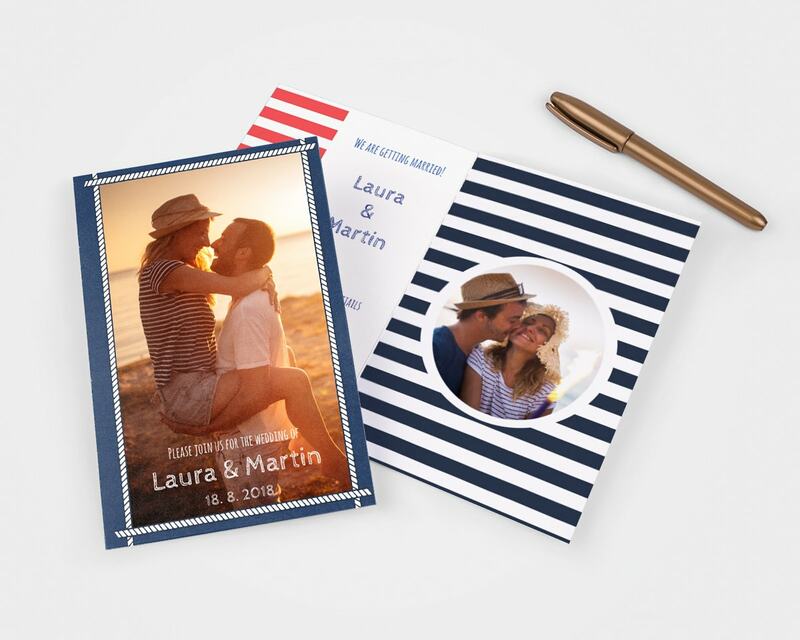 Create your invite from scratch using a striped background and a nautical rope frame. You can add extra details is you like. That’s the fun of creating your own invites! There are no rules. Are you an adventure-loving couple who loves the great outdoors? Will your wedding be taking place in a beautiful woodland or a mountain setting? Then an outdoor themed wedding is perfect for you. 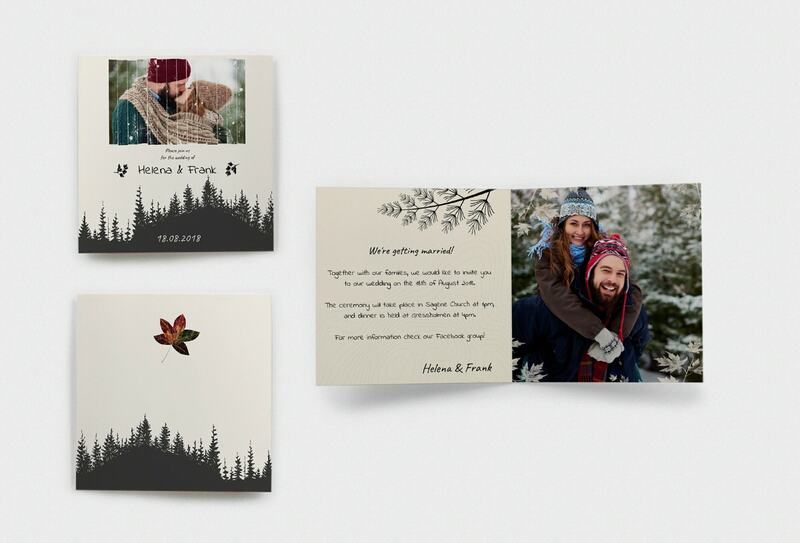 Create your own outdoor invites using some nature-themed clip art like trees, branches and leaves. Then choose a photo of the two of you in a beautiful natural setting. Simple but effective. Does your relationship cross countries? Will you be joining in an international partnership? We love the idea of travel-themed weddings for the romance. Use the world map and a heart clip art to mark your two countries on the map. 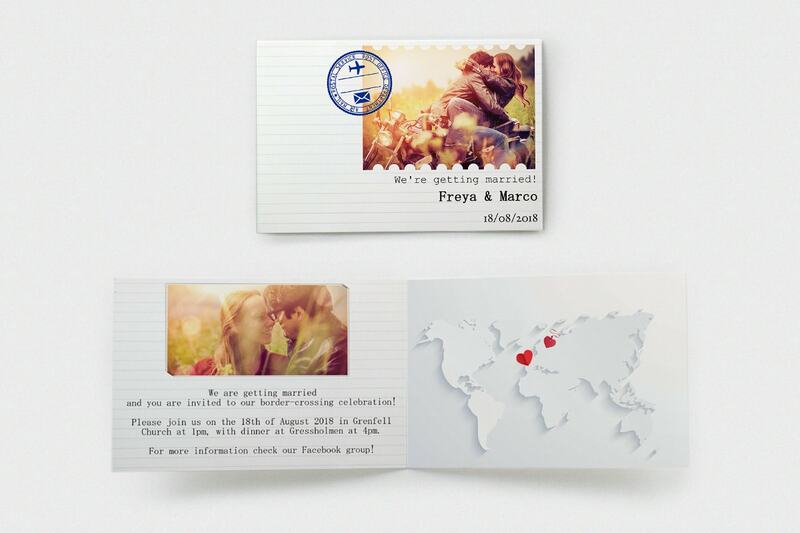 Then use any of our travel-themed clip art to decorate your invite. We love the stamps that will make your invitations look like a passport page. We hope this has helped you decide on your wedding invite. 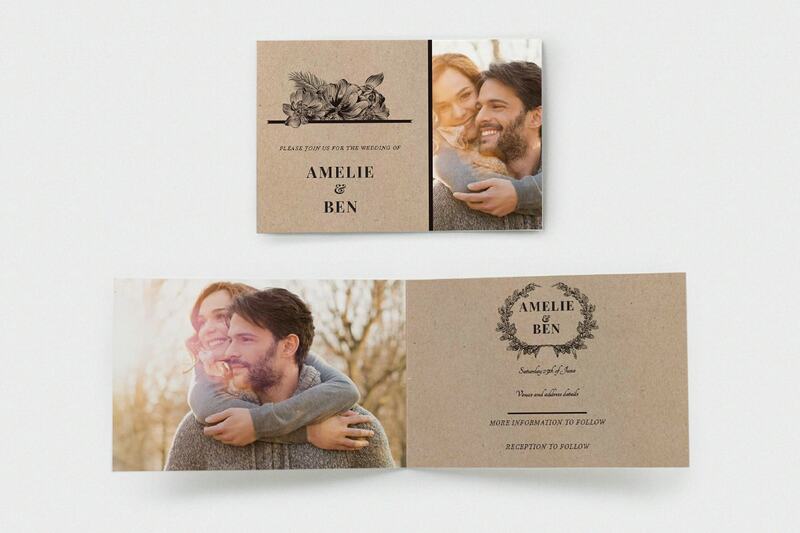 We also have lots of beautiful save-the-date cards and thank you cards to match all of our wedding invites. And if you’re not planning a wedding? 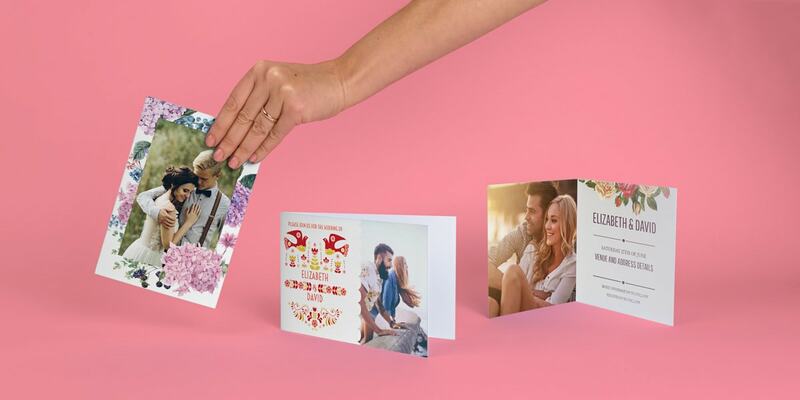 We have over 100 pre-designed cards so you’ll find one for every occasion. All our cards are fully customisable too so you can make them just to your liking. Know someone getting married? Then share this blog with them on social media using the icons below. They’ll thank you for it.